Flash to Video Converter is a converting tool to help users convert flash to video of mobile devices, such as swf to avi, swf to asf, swf to flv, swf to mov, swf to mp4 and swf to mpg. Flash to Video Converter is a converting tool to help users convert flash to video of mobile devices, such as swf to avi, swf to asf, swf to flv, swf to mov, swf to mp4 and swf to mpg. 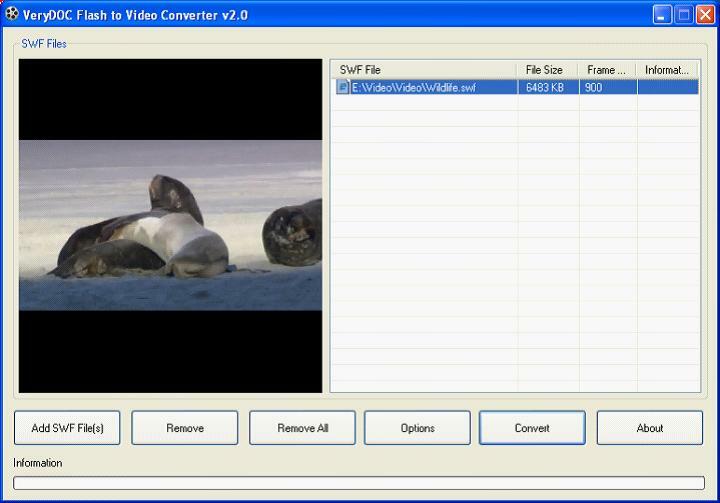 Flash to Video Converter also supports the batch conversion and supports customizing the size of video files. Key features of Flash to Video Converter: 1.Able to run in 32-bit and 64-bit Windows 2000 and later systems with the essential flash plug-in. 2.Convert flash to many kinds of videos.Such as swf to mpg in batches during one process. 3.Support converting swf to avi, swf to asf, swf to flv, swf to mov, swf to mp4 and swf to mpg. Besides, swf without video screen could be converted to the audio file of the related format without video screen. 4.Support adjusting width and the height of video. You can customize in terms of pixels according. Also the original size of video could be retained, too. 5. [Reset] button of option panel could be used to return to the original state of parameters.